Ideal Package for meditation and relaxation groups. The Mindfold Relaxation Mask is a flexible black plastic face plate backed with a high-density soft foam padding. 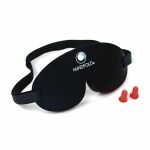 The foam padding has cutouts that allow you to experience total darkness even with your eyes open! New adjustable Velcro® head strap allows you to fit the Mindfold mask snuggly to your face. No more loose or sagging mask problems!